Come to the office with a clean face; no eye make-up, no lotion, and no sunscreen the day of your CO2 Laser Resurfacing Procedure. Be sure to be on time, you can verify the time you are supposed to be in by calling us any time. You may need extra time for topical anesthetic but most of the time this won’t be needed. Do not wear contact lenses. You will also need someone to drive you home. Starting the day of your Laser Resurfacing Procedure: The first thing we will do is bring you back to your room where you will get prepared for the procedure. We will need to have your caretaker sign the caretaker consent form. But you will likely already have this done. We would like your caretaker to understand what will need to be done to take care of you after your procedure. So your caretaker should read through the post care instructions and have all of his questions answered by our team. Additional payments that have not been done will be taken care of at this time. We will finish with any other consents that were not signed and other preparatory paperwork. Reviewing your Medical History and Reviewing our Plans: Dr Young will begin and go through your medical history one more time and discuss your procedure again with you to make sure that all of your questions are answered. We will do our best to make sure that you are comfortable. Dr Young feels that this extra time before your procedure can be very beneficial for you in getting you ready. Preparation with the Nurses and Surgical Technician: The nurse and surgical tech will then further help you along by making sure all of our checklists for safety are done. We will make sure that you have all the necessary photos that we need. We will have you change into a gown but you will have a choice on how much clothing you would like to leave on underneath the gown. Then we will take you back to the procedure room. You will have a chance to go to the bathroom first. Then once back there our nurse will start your intravenous line and after that we will take care of everything else for you. During the laser resurfacing procedure: To get you completely comfortable during the laser resurfacing, we use a combination of intravenous sedation and local / regional anesthesia. The local anesthesia is essentially the use of lidocaine and epinephrine that is injected directly and locally into the area that is to be treated. Regional anesthesia entails the doctor using essentially the same lidocaine but instead of local application, the local anesthesia is injected in the area around the nerves. This allows the local anesthesia to work on the section of your face / body where the nerves are supplying the feelings of sensation. Regional anesthesia blocks a region of the face / body. After you are numb the Doctor then proceeds to apply the laser and + / – dermabrasion. The combination of the local / regional anesthesia and the IV sedation will allow you to be in a very comfortable state. If you would like to read more about the different levels of anesthesia for cO2 Laser Resurfacing click here. Learn More About cO2 Laser Resurfacing and Fractional Laser Resurfacing: To get a better understanding of Active fx, Deep fx, Total fx, and Max fx cO2 Laser Resurfacing I will show you some pictures with explanations. The picture below shows the difference between Active and Deep fx. Active fx is more superficial working mostly in the epidermis and superficial layers of the dermis. Also below is another picture showing a side view of the skin. Active fx spots are also larger than Deep fx. Deep fx delivers smaller spots that go deeper to cause more tightening of the skin. In contrast Active fx is more superficial working on superficial pigmentation, and some tightening as well but also handling some superficial wrinkles. Deep fx works on general tightening and can help more deeper wrinkles and scars. When you combine both Active and Deep fx you are doing Total fx. Max Fx is using the Active but without untouched skin in between the dots. Essentially, Max Fx is Active without the fractionation. When you do more than 2 passes of Max Fx you are basically doing traditional cO2 laser resurfacing. The picture below can allow you to understand the Anatomy of the Skin a little better. The epidermis and the superficial dermis is where Active fx mostly works. Deep fx goes deeper with thinner cones of energy and to heat up the deeper tissue to cause more tissue tightening through a longer depth within the skin. Below is a picture showing Active Fx and the pattern on a tongue blade. As you can see on the left the density of the smaller dots are more spread and less dense. 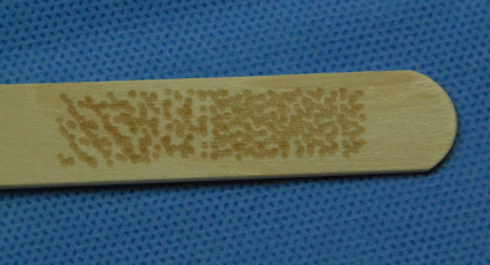 This is fractionated co2 laser resurfacing pattern. The patterns on the right are more dense. When you get to a point where the dots are really concentrated and dense leaving no intervening untreated tissue this becomes traditional resurfacing and not fractionated. The term for this become max fx. Max fx is the use of active fx without the fractionation, without the intervening untreated healthy tissue. Below is a picture of Deep fx. Notice how the dots are thinner with Deep fx versus Active fx. These dots show where the Deep fx is going deeper into the tongue blade and into tissue. Usually when you do Max fx you usually don’t do Deep fx given that there is so much energy being deposited that you could get into problems. Contact Aesthetic Facial Plastic Surgery: During this discussion if you ever have any questions you can call us at (425.990.3223), or email us any time. We try to respond within the first day and we are constantly checking our emails throughout the day.